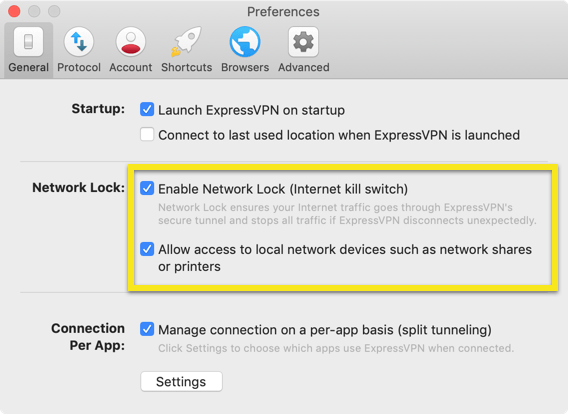 If ExpressVPN is connected or trying to connect and you are having problems accessing your printer or shared folders in your local area network (LAN), it might be because Network Lock is enabled. Network Lock is a feature in ExpressVPN for Windows, Mac, and Linux built to protect your internet privacy. It is ExpressVPN’s internet kill switch. For more information, see the guide on Network Lock. To regain access to your LAN, see the steps below. You can also find out more in this troubleshooting guide. Type the IP address of the printer in the Address field. Type the printer name in the Name field. Users of the ExpressVPN app for routers should have no problem accessing their network printers and other devices. Please check that your computer and the devices you want to access are all connected to the same network, via the router.